Disappointing sequel that scores highly in terms of cuteness but fails to learn any of the lessons of the first film and suffers from the side-lining of Jason Lee. Directed by Betty Thomas, Alvin and the Chipmunks 2: The Squeakquel is the sequel to the 2007 hit, which ended with the Chipmunks achieving fame and fortune as global pop stars. When the Chipmunks’ manager-slash-guardian Dave (Jason Lee, fulfilling his contractual obligation from the first film) winds up in traction after an on-stage stunt goes wrong, the Chipmunks (Justin Long as Alvin, Matthew Gray Gubler as brainy Simon and Jesse McCartney as dopey Theodore) are sent to school and wind up in the care of Dave's slacker cousin Toby (Zachary Levi, from TV's Chuck), who's too interested in playing video games to take his guardianship responsibilities seriously. 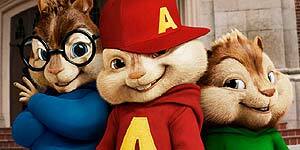 Meanwhile, the Chipmunks quickly adjust to school life, but Alvin finds his head turned by a clique of jocks and starts spending less time with his brothers. Meanwhile, shamed record exec Ian (David Cross) discovers a group of girl chipmunks called the Chipettes (Christina Applegate as Brittany, Anna Faris as brainy Jeanette and Amy Poehler as dopey Eleanor) and sets about turning them into rival superstars. As with the first film, the Chipmunks are superbly animated and interact perfectly with the real life actors. The musical numbers are fun, even if they do have too much of an eye on the cash-in soundtrack album - songs include Katy Perry's Hot N Cold and Beyonce's Single Ladies (Put A Ring On It). It's actually very frustrating that the filmmakers managed to lure three of Hollywood's funniest women to play the Chipettes, because the increasingly grating voice effects make them all sound the same and it's frequently difficult to hear what they're saying. Similarly, Levi is completely wasted in a thankless role that could easily have been cut altogether. However, the biggest problem is that the film just isn't very funny, lacking even the comedy set-pieces of the first film. In addition, the script is extremely lazy, substituting cuteness for anything resembling conflict, character development or the emotional moments you might expect from this sort of film. Kids who loved the first film won't find anything to complain about but Alvin and the Chipmunks 2: The Squeakquel is a disappointing sequel with painfully few laughs.